The following thumbnails represent pictures which our members have in their possession, or which we have been shown. 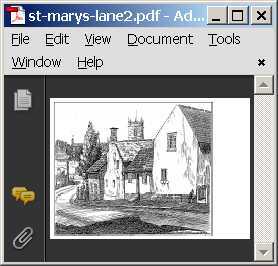 Marked "K/451/A/S:St.Mary's Lane, Ecclesfield drawn by W.G.Fox in 1887, donated by Capt. Alex & Mrs Joan Swann"
See also the photograph at the top of page 13 of Joan and Mel Jones "Pocket Images / Ecclesfield, Grenoside, High Green and Chapeltown"
Signed "Martin Davenport 49". 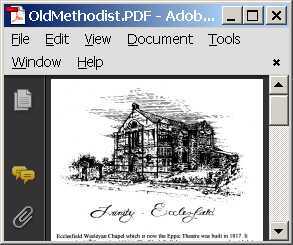 Martin Davenport is believed to have been an artist working for the Sheffield Telegraph. destruction to allow of the winding road to be widened. 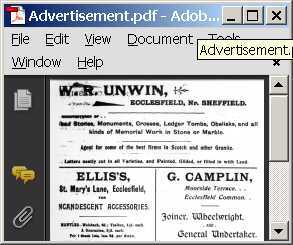 We might be about 100 years too late, but we are advertising W.R. Unwin -Stonemason, Ellis - Incandescent Mantles, G. Camplin - Wheelwrite, W.Allen - Bootmaker, and Frank Button, the man from the Pru. 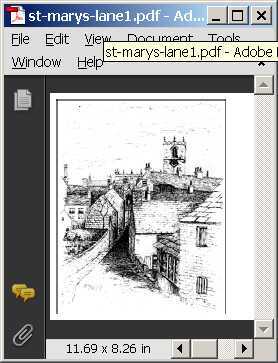 If anybody has any more information about these premises, including the old Bootmaker's shop on St. Mary's Lane, please let us know. If anybody has any further information on these pictures, or wishes to submit further pictures for the site, just email . 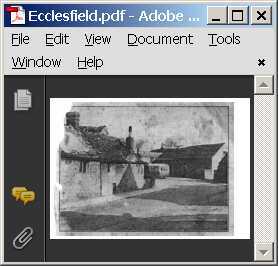 Otherwise, they could upload the pictures themselves to ecclesfield.wikia.com. Since these images did not originate with the Conservation Group, the Group does not own, nor claim to own the copyrights associated with them. We have therefore searched for the copyright owners, but so far without success. If however, the copyright owners would like to contact us, for instance by emailing then we would be pleased to remove the images or take whatever other steps are appropriate.